Chip Alone - The Chip's Challenge Wiki - The Chip's Challenge Database that anyone can edit! Those two fireballs are trying to rob your house! Capture them inside with your booby traps, then escape! 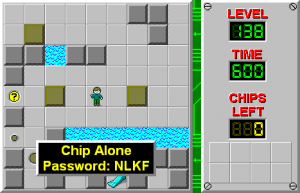 Chip Alone is the 138th level in Chip's Challenge Level Pack 1. It was created by Tom Patten. A secret area can be found by heading straight up from the exit and around the left to find a hidden pair of skates and fire boots, as well as a green key to use for the green doors that lead to where the two fireballs start at the very beginning. 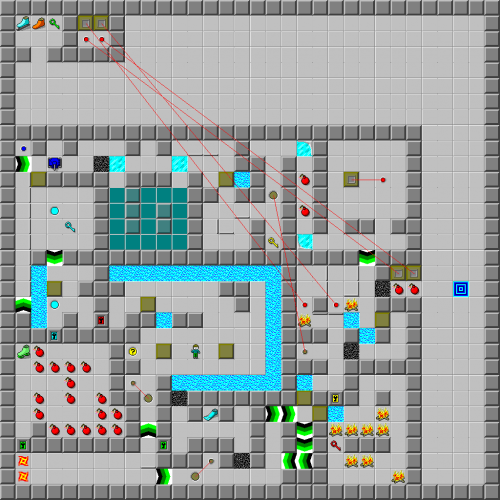 The partial post puzzle requiring two blocks can actually be completely bypassed by simply pushing the one block near the tank down one square below the teleporter, therefore causing the fireball to skip the entire west corridor and never having to push the second block. The level designer considered this a bust and had actually fixed it for CCLP1 release, but after being convinced by the CCLP1 staff to look at it as being a shortcut rather than a bust, it was reverted back to its original form.